PTSuks Uncanny World: Gygax, We'll *rolls two poly dice* miss 'em. Gygax, We'll *rolls two poly dice* miss 'em. Getting back from visiting my family in Michigan, a friend mentioned that Ernest "Gary" Gygax had passed away at the age of 69. I was "surprised" and certainly "Flat Footed". Gary as many new him, was the co-creator of The Dungeons and Dragons Role Playing Game, and the creator of the wildly popular fantasy world of which D&D takes many of its cues from, The World of Greyhawk. Like most people who played D&D when growing up in the 70's it was one of my first experiences playing a game where you didn't just go around the board and collect 200 dollars and where there wasn't a definitive "winner" of the game. The game was open ended and the possibilities were endless. The game was a great avenue to become creative and express yourself either in the characters you created or in the world you constructed. It lent well to artist endeavors such as creative writing, drawing, and painting. The game was fun and the experiences of playing with friends in a shared story made playing the game unique. In addition there were external benefits to the game as well. The "rule books" were all manuals of large amounts of text geared for adult reading levels. The 1st edition books contained complex ideas about the cosmology of the universe, mythological creatures, physics, other sciences. These books peaked interests in many people who played the game to explore these subjects at an early age. 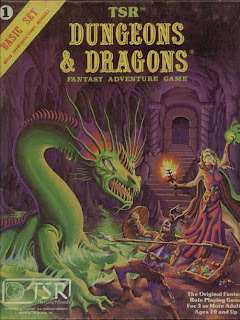 I myself, because of D&D, began reading more frequently and at a higher level early on. In grade school I was reading at a high school level. In junior high I had progressed to a college level material. Then upon entering college I qualified to attend honors courses strictly based on my reading skill and comprehension test scores. I recieved the first box set in 1978 as a christmas gift from my grandmother. It wasn't the famed "brown/white" box, but was the "classic" basic set No 1. which included the infamous "mud dice" colored a sky blue. I still have my original set and its in fine condition. I also have and still play with my "mud dice" which unlike others i've seen have held up realy well over the years and have not degraded at all. I think one reason is because they are cared for, and reside in a single pint crown royal bag, the dice bag of gamers everywhere! D&D is apart of me, and has made me what I am today as much as any other thing in my life. It has spawned many of my hobbies, of which there are many, and has only increased my love of all things that are "games". 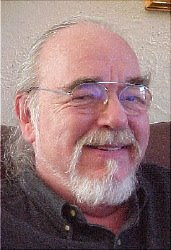 While Gary might not have had direct dealings with the creation of the core D&D rules in his later years, he was still a mover and and a shaker in creating game suplements, novels, participating in many of mailing lists and discussion groups about D&D and other games, and of course being just an all around nice guy. Many people have been expressing this across the world in news articles, on blogs, and message boards. Kenzer Co, where Knights of the Dinner Table is currently created and published from, has created a great tribute to Gary. Go HERE to view the .pdf tribute, its great and exactly what Gary did for us all. Then check out Knights of the Dinner Table game magazine which is directly a result of this whole gaming culture thing we all share. Gary you will be missed! 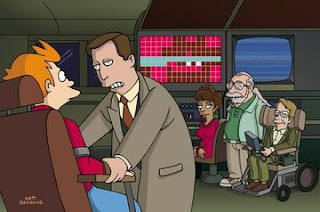 Gary was a good sport, spoofing himself, and the game culture in an episode of the cartoon Futurama, Gary is the 2nd from the right.